I really had a nice stay, I wish I could pay a longer stay. Close to the central Plaza and chairlift. They also have an excellent locker room on the first floor of the building to keep the skis etc, which is more comfortable than some of the other hotels. Everything was clean and proper. Reception staff was kind and helpful. It’s location as its just walking distance from hiring skies, purchasing skiing pass, restaurants, etc. Lock in a great price for Inside Plaza Sierra Nevada – rated 8.7 by recent guests! Inside Plaza Sierra Nevada This rating is a reflection of how the property compares to the industry standard when it comes to price, facilities and services available. It's based on a self-evaluation by the property. Use this rating to help choose your stay! One of our top picks in Sierra Nevada.In Plaza Andalucia, at the foot of the Sierra Nevada ski resort, these fully-equipped, modern apartments offer spectacular views of the mountains or the valley. Free Wi-Fi and ski storage are available. All apartments at Inside Plaza Sierra Nevada have central heating and a flat-screen TV. The full kitchen includes kitchenware, a toaster, microwave and fridge and Italian coffee maker. Sol y Nieve ski resort features a wide range of bars, restaurants and shops. Guests can get tourist information and book ski rental, ski classes and ski passes at the 24-hour front desk. The Inside Plaza Sierra Nevada apartments are just a 5-minute walk from the ski slopes. Central Granada is about 19 miles away. 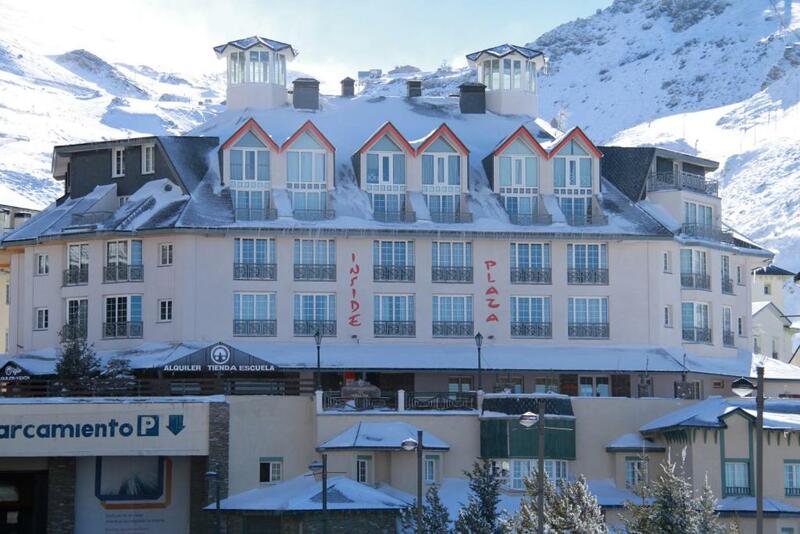 When would you like to stay at Inside Plaza Sierra Nevada? 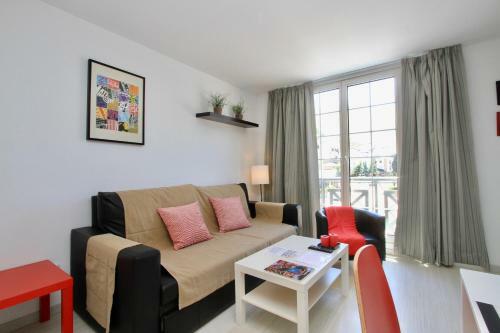 This comfortable, modern apartment with free Wi-Fi features one twin bedroom with fitted wardrobe and a bright and spacious living-dining area with a sofa bed and flat-screen TV. There is a kitchenette and a private bathroom with shower. Towels and sheets are provided upon arrival. 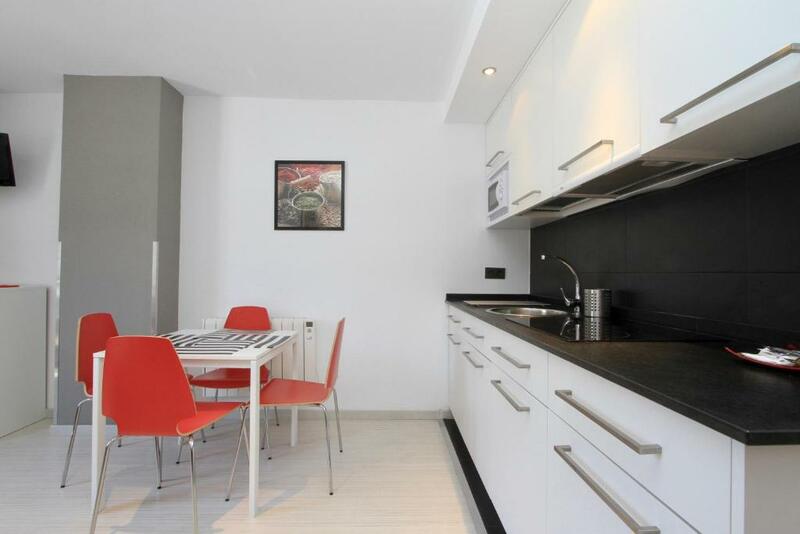 This comfortable, modern apartment with free WiFi features 1 living space with a private bathroom. There is a plasma TV and a kitchenette equipped with an Italian coffee maker, hob, microwave and electric kettle. Linen and towels are provided on arrival. There is a free locker service for ski storage. Please note this apartment does not have double beds. This comfortable, modern apartment with free Wi-Fi features one twin bedroom with fitted wardrobe and a bright and spacious living-dining area with a sofa bed, bunk beds and a flat-screen TV. There is a kitchenette and a private bathroom with shower. Towels and sheets are provided upon arrival. This superior studio has 2 single beds. The living-dining area has a double sofa bed and a kitchenette. 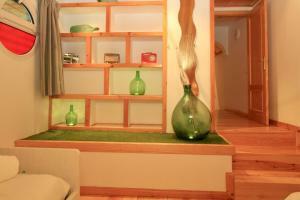 There is also a private bathroom, free Wi-Fi and a flat-screen TV. Featuring a terrace with views of the Sierra Nevada, this apartment has a living room with a sofa bed and a dining table for 6 people. There is a fully equipped kitchen, WiFi access and a ski locker. A spiral-shaped staircase connects the ground floor to the 2 bedrooms located on the upper floor. This duplex apartment features 2 double bedrooms, 1 triple bedroom, and 3 bathrooms with a bath or shower. Featuring views of the main square, the living room has a sofa bed, flat-screen TV, DVD player and dining table. There is also a well-equipped kitchen. There are floor-to-ceiling windows with views of the Sierra Nevada Mountains. Please note that pet are not allowed in this room. Compuesta por un equipo de jóvenes profesionales multilingües, adquirimos el compromiso de conseguir la satisfacción del cliente, siendo nuestro objetivo principal que quienes nos eligen encuentren en nuestros apartamentos un lugar ideal ! Granada Inside nace en 2005 como empresa pionera en la gestión de apartamentos turísticos en Granada, para atender las necesidades de un público que, cada vez más, reclama este tipo de alojamiento para sus viajes. House Rules Inside Plaza Sierra Nevada takes special requests – add in the next step! Inside Plaza Sierra Nevada accepts these cards and reserves the right to temporarily hold an amount prior to arrival. Please note that there is no 24-hour reception on site. From 15 May to 15 November, please contact the property directly before arrival. Late check-in after midnight is subject to a surcharge of EUR 25. Towels and sheets are provided upon arrival. Please note that pet are not allowed in the Three-Bedroom Duplex Apartment (10 Adults). Please inform Inside Plaza Sierra Nevada of your expected arrival time in advance. You can use the Special Requests box when booking, or contact the property directly using the contact details in your confirmation. Really welcoming staff on arrival. Warm and plenty of natural light in the rooms. Lots of hot water and two great showers in the apartment. The refurbished rooms were simple but nicely decorated, though the kitchen area had everything you could need for a short stay inc coffee machines, toasters, even a washing machine. Lockers outside our room for our skiing gear. Easy to hire ski stuff through reception. Like a ghetto.....tiny accommodation,thin walls,very noisy at night. Only has ski lockers in hotel. Other hotels have ski & boot lockers next to the slopes. So you don’t have to walk any distance with the heavy equipment. Very pleasant, warm flat. Plenty of utensils in the kitchen; cosy beds & sofa. Nice view, ski storage on first floor.